The Chengdu J-20 is a stealth fighter produced by the People's Republic of China. Original model by Erwin Welker. New VC, panels for wide and standard screen, gauges including GPWS callout by Philippe wallaert. Compatible with FSX versions and P3D up to v3. See instructions in the readme.txt file. 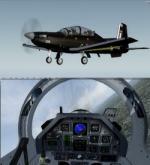 FSX/P3D Raytheon/Beechcraft T-6 Texan II US Military Pack 3. 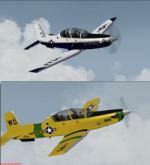 This is the ex-payware T-6 II Texan from Iris in 3 US liveries. US Navy 180, USMC VMFAT-101, and USMC OT-6B VMO-1 ER. The Beechcraft T-6 Texan II is a single-engine turboprop aircraft built by the Raytheon Aircraft Company. A trainer aircraft based on the Pilatus PC-9, the T-6 has replaced the Air Force's Cessna T-37B Tweet and the Navy's T-34C Turbo Mentor. Special thanks to Iris Simulations/Dave Brice for allowing this to be distributed free. Thanks to Robbie Nauffts, John Detrick for the great textures. Put together and tested in P3Dv4 by Chris Evans. Should work in FSX and all previous P3D versions. 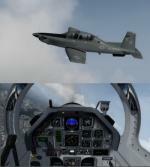 FSX/P3D Raytheon/Beechcraft T-6 Texan II US Military Pack 2. 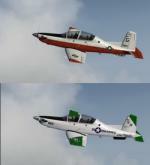 This is the ex-payware T-6 II Texan from Iris in 3 US liveries. USAF Don't mess with Texas, USAF Moody AFB, and USMC VMIT-10 Retro. The Beechcraft T-6 Texan II is a single-engine turboprop aircraft built by the Raytheon Aircraft Company. 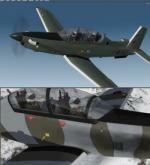 A trainer aircraft based on the Pilatus PC-9, the T-6 has replaced the Air Force's Cessna T-37B Tweet and the Navy's T-34C Turbo Mentor. Special thanks to Iris Simulations/Dave Brice for allowing this to be distributed free. Thanks to Andy Nott, Chris Brisland, John Detrick for the great textures. Put together and tested in P3Dv4 by Chris Evans. Should work in FSX and all previous P3D versions. FSX/P3D Raytheon/Beechcraft T-6 Texan 2 RAF Pack 1. 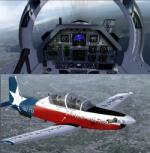 This is the ex-payware T-6 II Texan from Iris in 3 RAF liveries. RAF Cammo, Green and Gloss Black. The Beechcraft T-6 Texan II is a single-engine turboprop aircraft built by the Raytheon Aircraft Company. A trainer aircraft based on the Pilatus PC-9, the T-6 has replaced the Air Force's Cessna T-37B Tweet and the Navy's T-34C Turbo Mentor. Special thanks to Iris Simulations/Dave Brice for allowing this to be distributed free. Thanks to Andy Nott for the great textures. Put together and tested in P3Dv4 by Chris Evans. Should work in FSX and all previous P3D versions.